There’s a new social network in town! Now before you roll your eyes and whine about how you can’t keep up with all these social networking websites popping and left and right, hear me out. I understand how you feel. I too love social networking but don’t like having to get to know and adjust to new websites all the time. I like keeping my social networking accounts to a minimum, lest I’ll go crazy trying to maintain all of them. But when something like Favics comes along, I just can’t help but give it a try. What makes Favics different is that it’s a social networking website dedicated entirely to fashion enthusiasts, bloggers, designers, photographers and underground labels. Basically, it’s a social fashion network where like-minded and passionate people can find each other easily and possible collaborate or get discovered. There are so many young, aspiring and outstanding fashion labels and fashion designers, for example, that are still undiscovered. Maybe it’s because they’re not mainstream enough or they don’t have a lot of funding to back them up. Favics aims to give these people a place where they can be recognized. Signing up with Favics is easy. 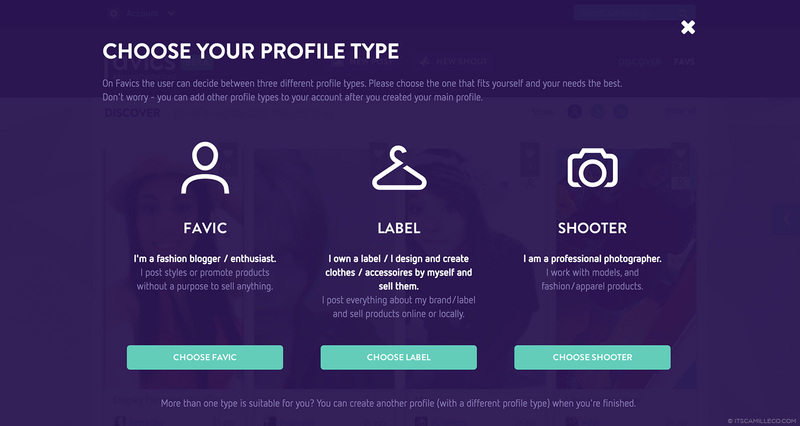 After giving the necessary information, you’ll be able to choose among 3 different profile types–blogger/enthusiast, label/designer and shooter. If 2 or more profile types are suitable for you, you can create another profile type under the same account later. Then off you go! Time to post photos and/or shout outs. Both of which can be reposted. You can also include links to your website on your photo posts and even add tags to let people know where they can find the items on your photos. Favics is like a Facebook/Instagram/Lookbook.nu/Twitter in one, except it’s tailored for fashion lovers like us! Since Favics was just launched a few months ago, more features are yet to come. Hopefully, features like blogging functionality, online shop for labels, bid system for unique creations and a collaboration system for business inquiries will be added to the website soon. How exciting! Ready to sign up and join? Let’s #destroythestandard together through Favics! I cannot download. It may not international apps yet. I think so! You’re welcome! This site sounds like a fantastic idea! Thanks for sharing! Just created my account! Lol this is so cool! it’s like instagram/chictopia/lookbook! Haha Thanks for sharing this cool new site! Thanks Erika! Sige next time!